Hi, I’m Ray. I’ve been repairing and restoring valve radios for over 50 years. It’s funny to think that the radios I now work on weren’t classed as vintage when I repaired them back in the 1960s. Things were different in those days. The trade enjoyed a friendly and trustworthy relationship with their customers and the majority of new customers came from word of mouth recommendations. Back in those days, customers were loyal because they were looked after by their local service engineer. If there was a problem with a radio or television I’d repaired, it went without saying that I’d put it right – free of charge. That’s the way it was back in the old days. I’m from the old school and, as far as I’m concerned, nothing has changed. If I repair your radio and, several years later it develops a problem due to my workmanship, bring it back to me and I’ll put it right. I won’t quibble about the date on the guarantee. And I never forget my golden rule… Without you, the customer, I would be out of business. Whatever happened to the days when service engineers valued their customers? Where are those engineers now? I can’t speak for them, but I’m still here. The golden age of radio isn’t dead – it’s just covered in cobwebs. There are still many people who appreciate listening to the wireless, and I’m one of them. One aspect of old valve radios that intrigues me is the thought that the BBC Home Service would have emanated from the loud speakers during the war years. Churchill would have spoken to the nation during the war, and a host of interesting programmes entertained families during the forties and fifties. Imagine a beautiful radio with a highly polished wood or Bakelite cabinet taking pride of place in the lounge back in the 40s and 50s. I can picture the man of the house sitting in his armchair, smoking his pipe and listening to the Suez crisis during the 50s while the children played with tin toys on the floor. Housewives’ Choice, Mrs Dale’s Diary, The Billy Cotton Band Show, Music While You Work, The Goon Show, The Clitheroe Kid, Round The Horn, ITMA with Jack Train, Ken Dodd, Sing Something Simple… All these programs and more would have been listened to on valve radios. As I child, I had a valve radio on my bedside table. The dial lamp glowing in the dark, I’d listen to a play and lose myself in the plot. Great stuff. DO YOU WANT YOUR VINTAGE RADIO REPAIRED? Many of you reading this will recall listening to your own or your parents’ valve radio in the lounge and enjoying Listen With Mother or an evening drama or short play. 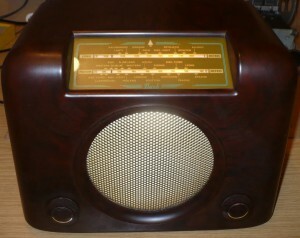 A vintage radio is something which should be used and enjoyed, and you can enjoy yours once again. If you have an old radio in the attic, drag it out and wipe the dust from the cabinet. Do you remember that radio standing on the sideboard? Having spent forty years in the attic, it probably won’t work – and I advise you against plugging it in. However, it needn’t cost you a small fortune to have it repaired. If you have a vintage valve radio which you’ve found in the attic and you’d like to hear it working again, check out my repair service. There were a lot of short wave listeners in the old days, and I was one of them. Many early radios covered the short wave bands and it was great fun tuning around during the evenings listening to broadcasts from far away lands. If your old wireless covers short wave, you might try putting up a decent aerial. Some of the better, more expensive, radios had an extra valve called an RF amplifier for improving short wave reception. But even the standard sets will pull in stations from all over the world with a simple wire aerial. Although I specialize in Bush radios, I also repair and restore most British makes and models from the 1940s and early 50s. Marconi, HMV, RGD, Bush, Pilot, Pye, Ultra, Murphy, KB, GEC, Cossor, Ekco… If you have a British vintage valve radio you’d like to hear working again, take a look at my radio repairs page. Out of interest, I’ve created a page showing the test equipment I use in the radio workshop. Signal generator, oscilloscope, audio output meter, multimeter… take a look. There are occasions where a vintage radio is beyond restoration. Rather than use the radio as an ornament or, worse still, dump it, it is possible to add Bluetooth technology. Contrary to popular misconception, this can be carried out without destroying the radio. Read more here.